BDS Colombia continues to stand in with Palestine in their struggle against the Israeli illegal military occupation of their lands. 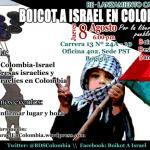 As part of their commitment to support the Palestinian call for boycott, divestments and sanctions against Israel, BSD Colombia organized a seris of talks between June and August 2013 to address economic, military and cultural relations between Colombia and Israel. The Palestinian Boycott, Divestment and Sanctions National Committee (BNC) has met with the Brazilian consul in Ramallah Paulo França to call on Brazil to abandon a $35m development collaboration project with Israel. The delegation urged Brazil to at least ensure that money from the project will not be diverted to Israeli companies that are implicated in human rights abuses and violations of international law. Report: Brazil's cooperation with Israeli violations of international law and human rights? We argue that beyond legitimizing and sustaining Israeli policies, the cooperation program risks to recognize and/or directly aid and assist the construction of the Wall and the settlement enterprise and the maintenance of the situation created by them as well as other Israeli violations of peremptory norms. South African civil society and organised labour call on South African officials to show leadership by demanding change to the shamefully discredited “Kimberley Process Certification Scheme” which facilitates trade in diamonds that fund gross human rights violations by rogue regimes, and by securing decent jobs for South Africans in diamond beneficiation. 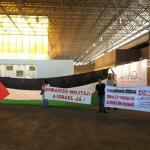 Demonstrators from the BDS campaign in Brazil (boycotts, divestments and sanctions) showed their solidarity with Palestine last week when they staged protests at the LAAD Fair. The LAAD fair (The Latin American Aerospace and Defence Exhibition) took place at the RioCentro in Rio de Janeiro from the 9 – 12 April and had been dubbed by activists the "Fair of Death". Last week the hacking group Anonymous launched a cyber-attack campaign dubbed #OpIsrael replacing Israeli homepage messages with anti-Israel slogans and causing massive disruption to government, academic and private sites. The attach reached its peak on Sunday with high-profile government systems such as the Foreign Ministry, the Bank of Jerusalem, the Israeli Occupation Ministry, the IOF blog and the Israeli President's official website all being hacked. I have never been in a courtroom or a jail before now. I cannot draw a direct comparison to anything I know from the UK. But I am certain that the court hearing of Stop the Wall youth coordinator Hassan Karajah on 14 February at Jalameh military court near Haifa was not like anything I could have come across in the UK. All major Palestinian farmers organizations have issued a call to end international trade with Israeli agribusiness and have also published this briefing entitled Farming Injustice. Farming Injustice details the systematic destruction of Palestinian agriculture by Israel and the role played by international trade with Israeli agribusinesses. To download the briefing, click here. Palestinian agricultural organisations today issued an appeal for international civil society to take action to pressure supermarkets and governments to end trade with Israeli companies that operate in settlements, which finances and rewards settlement expansion and other violations of international law. The occupation courts have forbidden Hassan Karajah's lawyer from seeing him until Sunday, February 10 2013. In the meanwhile international pressure is growing. 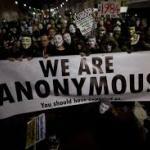 European governments are alerted about the case and international civil society is mobilizing. Amnesty International has released a statement on Hassan Karajah asking their members and concerned citizens to address Israeli authorities regarding the case. Fore more click here. This morning, more than 200 Palestinian Grassroots Committees activists started construction of (02.02.2013) the village of “Bab Munatir” on the land of the Munatir area – land threatened with confiscation by the Israeli army of occupation and settlers in the Palestinian village of Bourin, south of Nablus region. Please se below the video explaining Hassan Karajah´s arrest. Hassan Karajah is currently held in the Jalameh Interrogation Center. He has been reportedly beaten by occupation forces and his detention has been extended for 12 days, without access to his lawyer. Where’s the Accountability for Israeli War Crimes? The Palestinian Authority would be “traitors” if they agreed to a condition the UK is seeking to impose in exchange for agreeing to support Palestine upgrading its membership in the UN. So said Raji Sourani, Director of the Palestine Center for Human Rights (PCHR) at a meeting with lawyers from the National Lawyers Guild (NLG) in Gaza City today. As a result of the Israeli aggression on Gaza protest demonstrations and solidarity marches was arranged all over the West Bank – From Jenin in the north to Hebron in the south. Once again the occupation forces of Israel suppressed the popular resistance of the Palestinians. Let’s stand together in solidarity with Gaza! 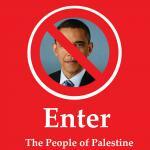 Let’s build solidarity for a free Palestine! Probably never before have the last weeks of preparation for a WSF event been marked by such a strong sense of urgency and importance: Now more than ever we need to stand together, organize and show the strength of global solidarity with Palestine! Activists block the entrance to G4S’ offices in Oslo. Early this morning, a group of activists from the Palestine Committee of Norway blocked the entrance to the offices of the security firm G4S in Oslo. 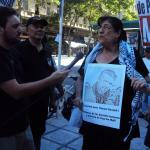 The activists demanded that G4S stop all activities that contribute to the occupation of the West Bank and Gaza. The blockade adds weight to a petition — signed by 21 Norwegian organizations — which was presented to G4S management last week. The Palestine Committee of Norway arranged several big and small demonstrations in support for our friends in Palestine, and especially the inhabitants of the Gaza Strip, Saturday November 17th. In the main cities, Oslo, Bergen, Trondheim, Tromsø, Lillehammer, Hamar, Narvik, but also in smaller towns, people met to condemn the attacks, the bombing, the killings of civilians, but also to protest against the Israeli occupation. NEW YORK (25 October 2012) – The United Nations Special Rapporteur on the situation of human rights in the occupied Palestinian territories, Richard Falk, today called on the UN General Assembly and civil society to take action against Israeli and international businesses that are profiting from Israeli settlements. 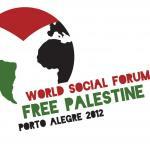 Video: Join the WSF Free Palestine! Watch the video and share it with your networks! Del 28 de noviembre al 1 de diciembre, miles de activistas, organizadores, jóvenes, grupos religiosos, sindicatos, músicos, académicos y muchos más, se darán cita en Porto Alegre, Brasil en el primer Foro Mundial Social dedicado exclusivamente a Palestina.